Motorhome Towing a Truck & Boat+Trailer: What Could Go Wrong? 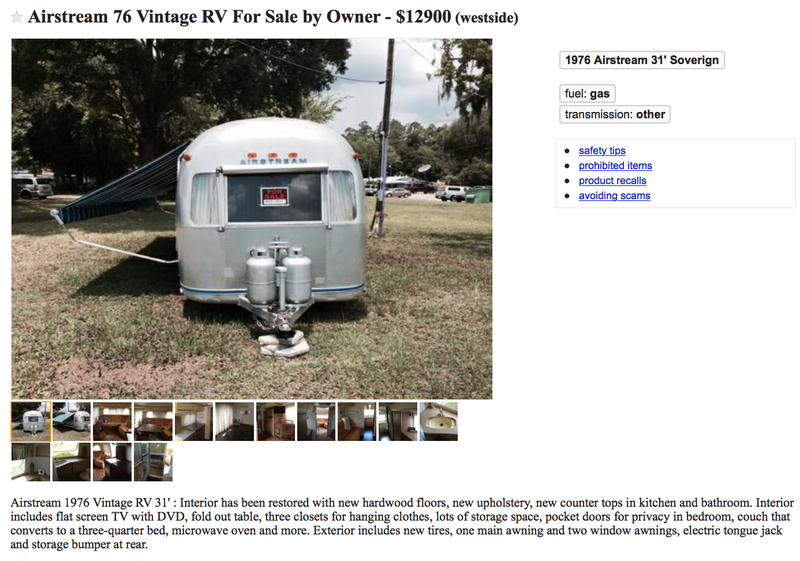 Do you wince at the idea of buying a forty-year-old trailer? You might be OK if it looks like this one. 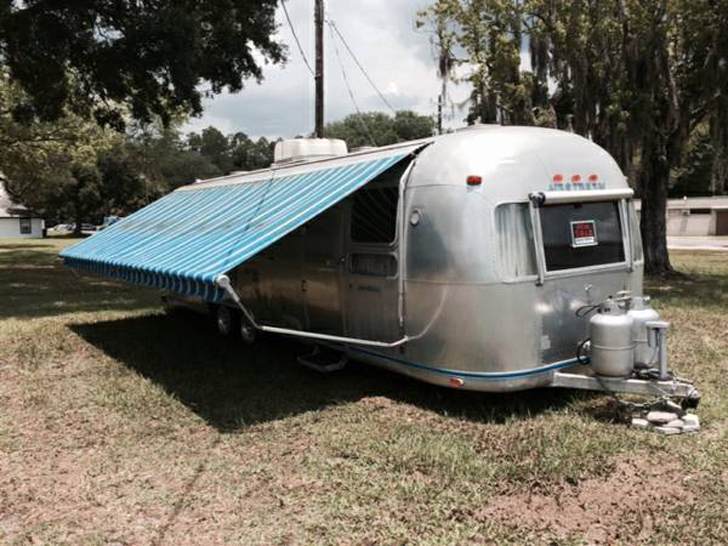 From the land of Florida, which seems to be the travel trailer capitol of the known universe, we bring you a classic aluminum beauty that has been restored to time capsule perfection. If you long for the bicentennial, or just think the 70s were cool, this is the one for you. 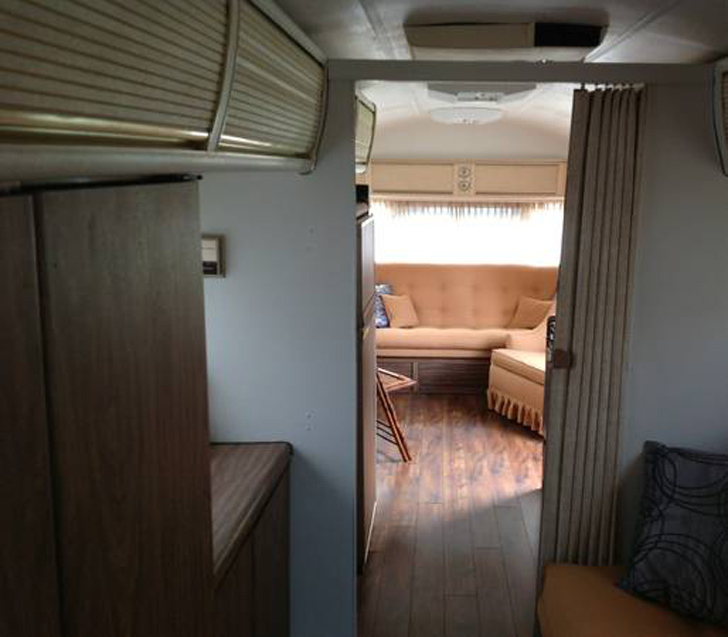 And just to be clear, this trailer has an understated, classic 70s look – it’s not “Brady Bunch” land we’re talking about here. This classic includes the original large awning to provide heat relief and enlarge your outdoor living space. The Airstream Land Yacht, a 31 foot model, is set up for bumper pull, giving you lots of flexibility in tow vehicles, from large sedans and SUVs to pickups. 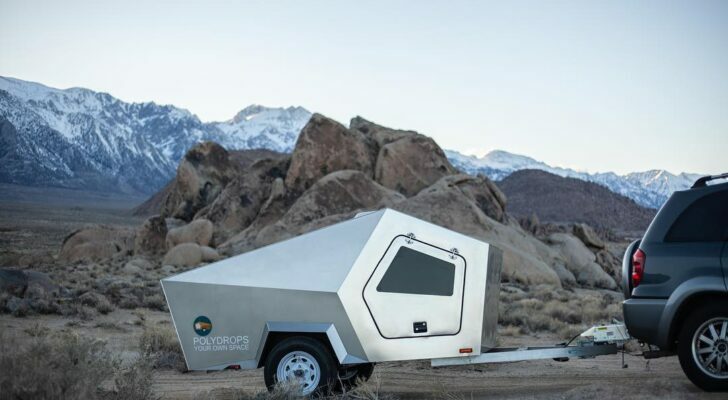 Well-equipped with gas appliances that run off of liquid propane, the trailer comes fully stocked with a refrigerator and air conditioner. 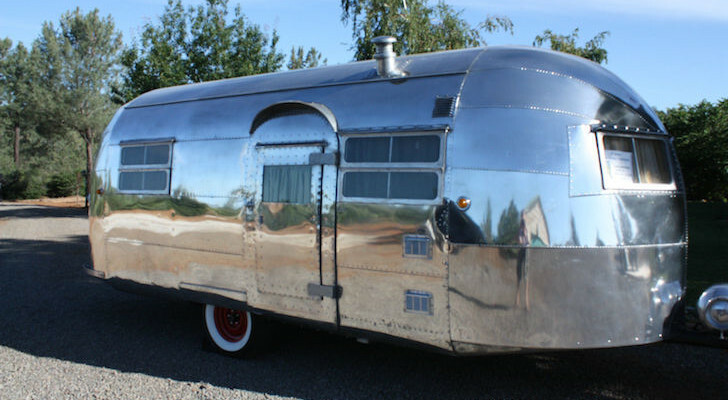 The beauty of the Airstream: build quality that’s kept over 70% of them on the road up until today, making the trailers an excellent investment. This one in particular appears very well kept. Large seating area converts from dining room to spacious bed. 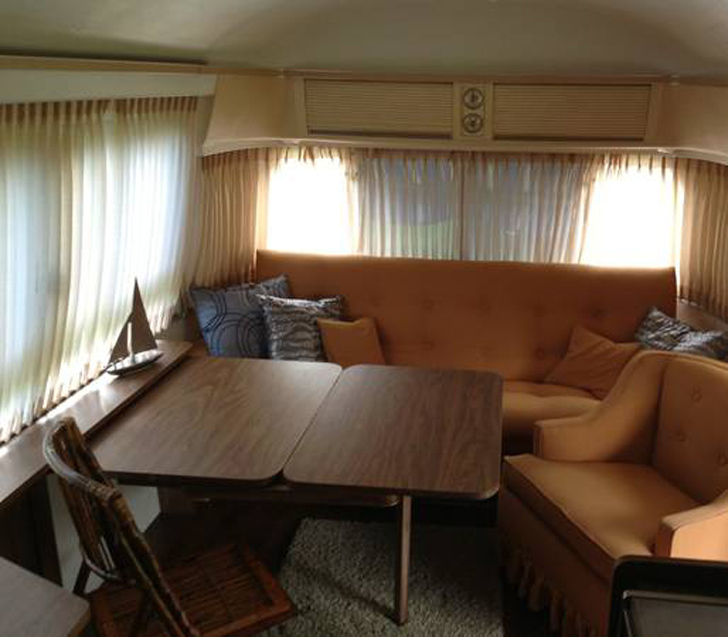 This classic Airstream turns 40 years old this year, but it doesn’t look a day over 38. The exterior is beautifully maintained, down to the original striped awning and large propane tanks. 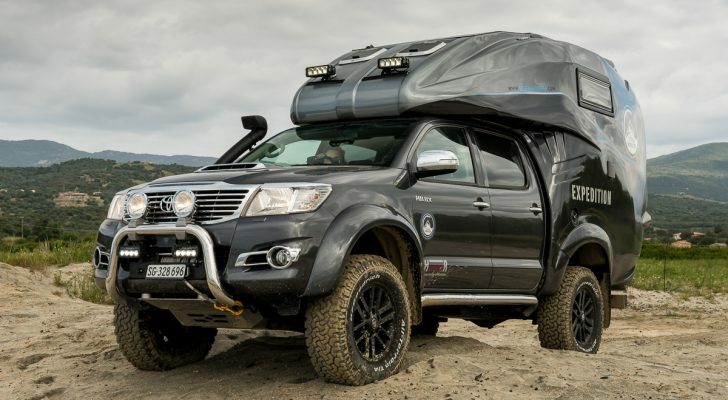 There are also two smaller window awnings, providing a lot of shade to keep the interior cool on hot days, and the tires and electric tongue jack are brand new. Master bedroom seating area converted for dining. 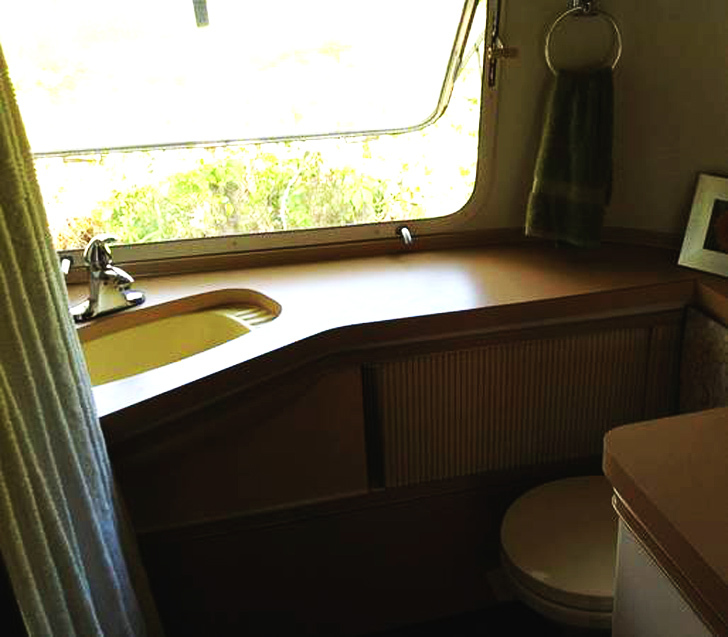 Inside, the trailer has been updated, while staying true to the original style Both the kitchen and bath have gotten brand new laminate countertops in the style of the original. 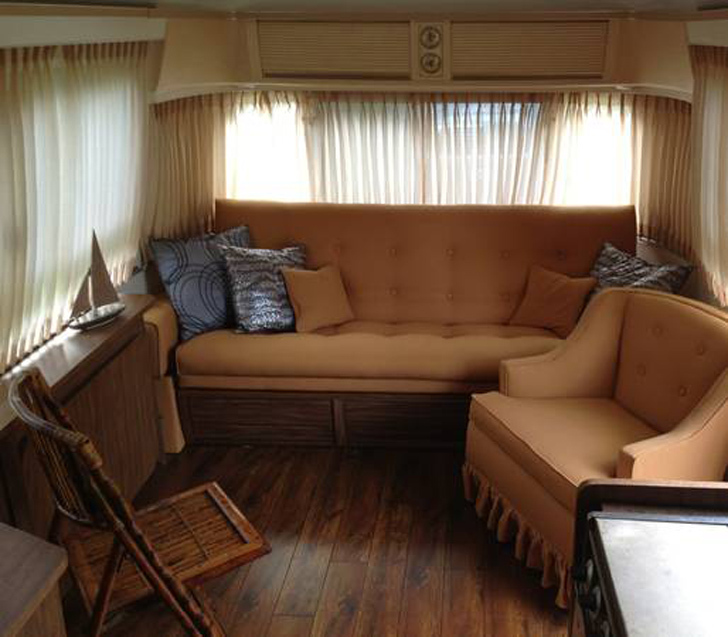 New upholstery and fabrics add some nice touches throughout and the original linoleum flooring has been replaced with hard wood laminates from front to back for easy maintenance and a classic, yet modern feel. Beautiful new laminate counter in the original style. All original appliances appear to be in immaculate condition and any surface that is not refurbished has been beautifully maintained, while the new color palette blends seamlessly into the classic style. You’ll find lots of wood grain laminates and classic 70s curved plastic surfaces everywhere – the “mod” feel is strong in this one. 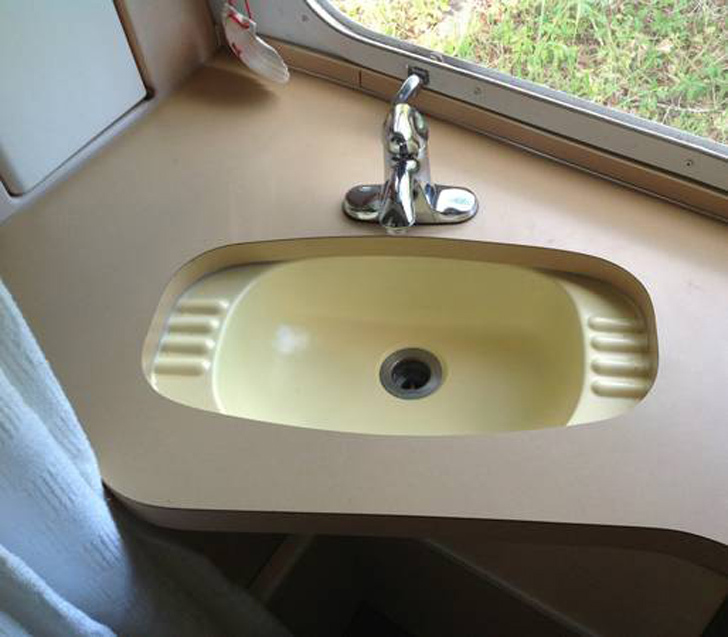 Lots of cool vintage detail has been preserved, like this bathroom sink with integrated bar soap holders. 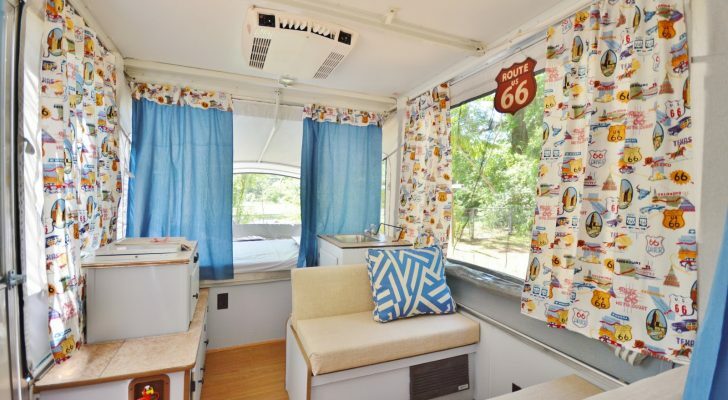 The sitting area and bedroom at the rear of the trailer is especially nice, with windows on three sides and retractable pocket doors that slide out to close off the space for privacy at bedtime. All of the classic fixtures, from sinks to cabinet pulls have been maintained, while a few modern touches, like a flat screen TV and built in sound system speakers take care of modern needs. 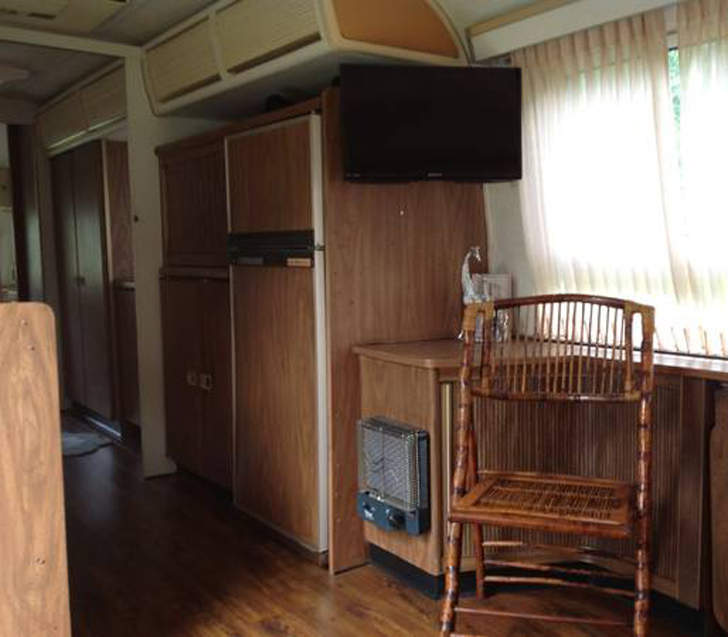 Two views from mid trailer, facing the front master bed and toward the rear. A kitchen view featuring the retractable overhead bins and the original nameplate. 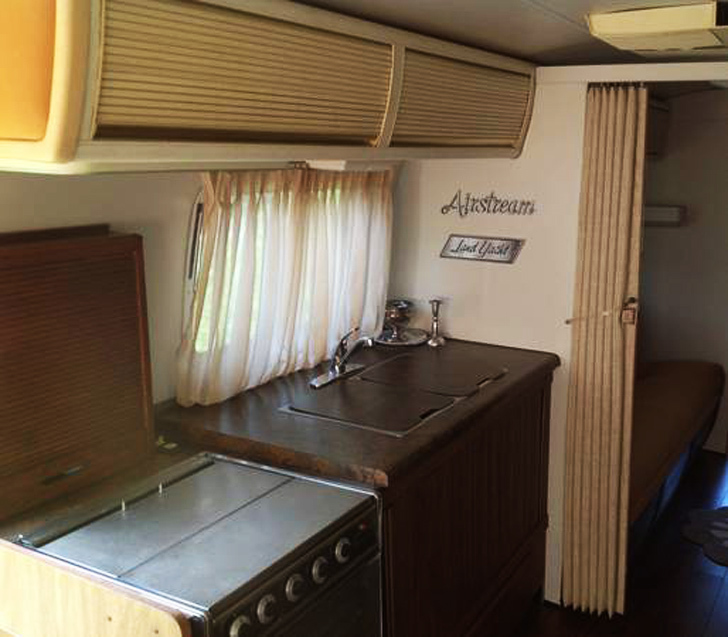 The owner provided us with some great images that make for good inspiration for your own Airstream refurb, or tell you what you need to know if you’d like to buy yourself an Airstream in Florida. This one appears to be done right and has lost none of its original charm, while allowing for some sensible updates to suit the modern traveler. See the original ad or view an archived copy if the link doesn’t work. 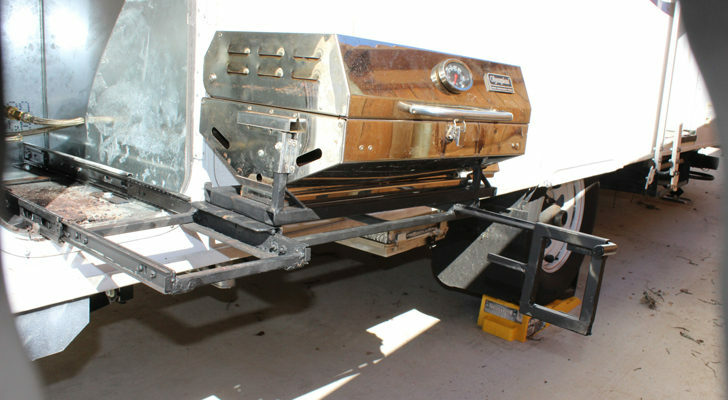 See This Professionally Restored 1948 Curtis-Wright Model 5 Trailer.